First we had St. Patrick’s Day. And Emerald City Comic Con, which naturally uses the color green rather heavily with the brand. And things are definitely greening up, Seattle hit a temperature high for the month of March the other day. So to further celebrate, a green dragon I’ve been working on! I was aiming for a look closer to Singe from Dragon’s Lair (inspired by the most excellent cartridge version of this game recently released by Tursi for the TI-99/4a, a marvel of technological accomplishment!) but I think he came out looking pretty good. May still need some tweaking… Or twerking. Maps are basically done for 75% of the game now, time to turn my attention to scripting and mobs for a bit and get that part caught up. 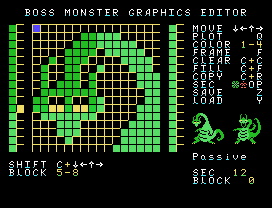 This entry was posted in CRPG, Design, Personal, Screenshots, TI-99/4a. Bookmark the permalink. Thanks! I tweaked him a bit further after this to get the proportions for his neck just right, and make the head in attack mode more closely resemble passive mode. Large monsters are a bit more fun to do because I have more resolution to play with.